Albuquerque, NM – Grassroots 365 2nd Annual G365 Albuquerque City Classic gave Southwest teams an early season opportunity to rise up the G365 Rankings that are scheduled to be released in early November. 2023 New Mexico Dogs won three straight over a very tough field to take home the championship trophy. The New Mexico Dogs defeated the Mountain West’s top ranked team, Give Sports in the semifinals and the Southwest region #6, Elite Roadrunners in the championship game to force their way into a G365 Top 25 ranking. 2024 D1 Nation fell just short of a G365 Top 25 ranking during the 2017-18 season. After going 4-0 and winning by an average margin of 26 points, D1 Nation put the West Coast on notice and will vault to early season G365 Top 25 ranking. 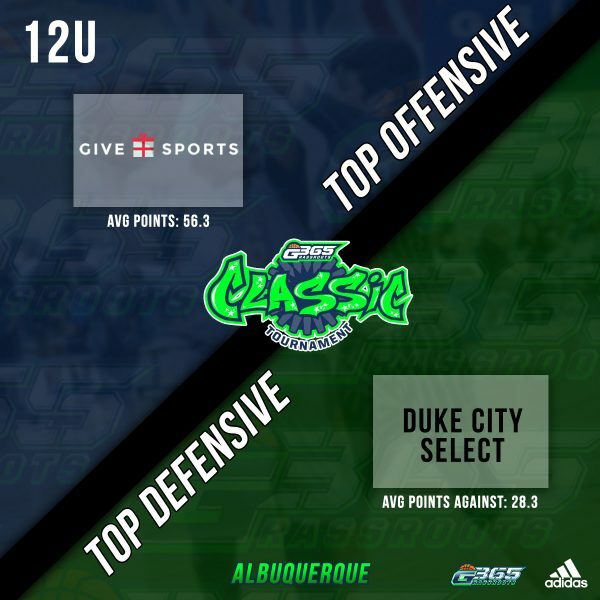 In the 12U division, NM Force went an impressive 4-0 to take home a championship along with a spot in the G365 Top 25. Give Sports 2025 earned a MW Region Top 10 ranking by finishing in 2nd place after going 4-1 in the event. For 11U, the El Paso Aztecs continued their impressive run from the past season by going undefeated in their championship run in New Mexico. The team from Texas is the only Texan team ranked in the G365 Top 25.